Combine all meatball ingredients in a large bowl and mix gently until well incorporated. Scoop heating tablespoon portions onto an ungreased baking sheet. With dampened hands, roll into balls. Bake 20 minutes, until browned. In a large skillet, heat canola oil over medium heat. Cook onion until softened (about 4 minutes), then add cumin, oregano, salt and pepper. Add garlic and cook 2 minutes more. Remove from heat. In a food processor, process granola (with chocolate). Add onion/garlic mixture and the peanut butter. Process until well combined. Add chipotle sauce and chicken bouillon; process again. With processor running, stream in hot water until desired consistency is reached. Pour mole into the large skillet and keep warm over low heat. 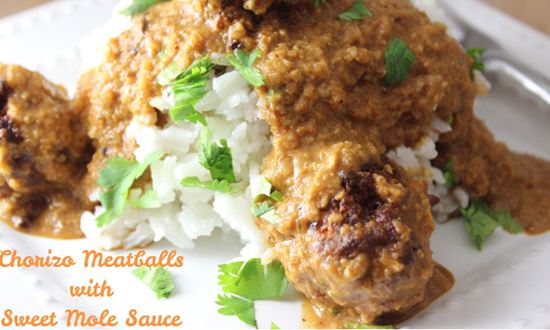 When the meatballs are cooked, transfer them into the sauce and toss to coat and heat through.